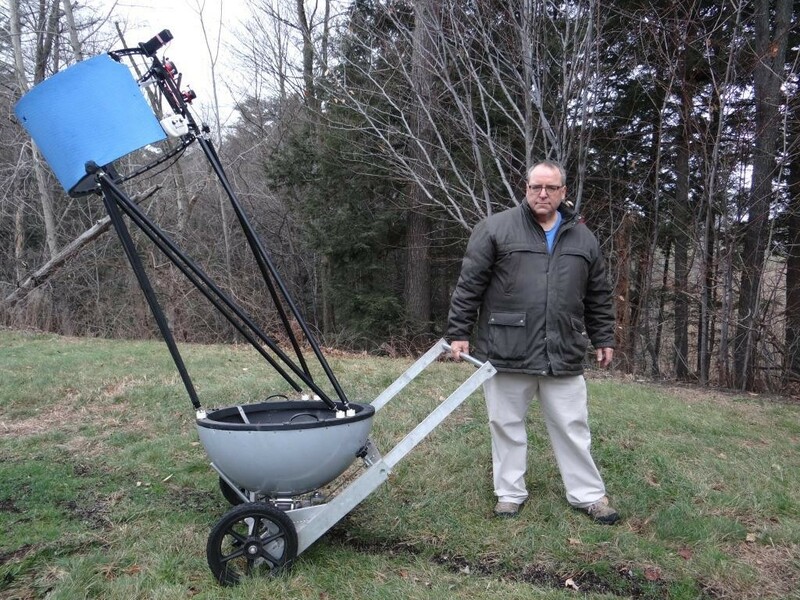 You will notice that, contrary to almost all Dobsonians equiped with wheelbarrow handles, I pull my telescope instead of pushing it. This picture clearly shows the center of gravity of the instrument is directly over the wheels. 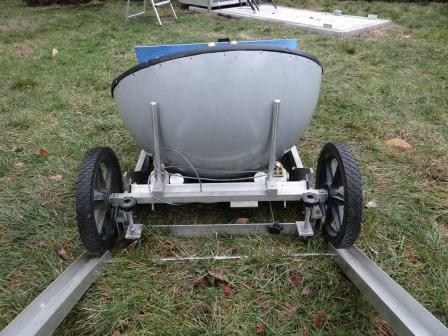 Telescope transportation is accomplished through a number of features incorporated in the frame of the drive platform. First, a retractable carrying handle nests inside the square, tubular side frame and locks in position, providing a leveraged arm with which to move the assembled or disassembled telescope. Connecting the two side handles is a 1 inch diameter aluminium tube which is what I hold onto when transporting the instrument. When the telescope is in position, the round tube is simply pushed back into the square tubular frame, out of the way but always immediately available if required. 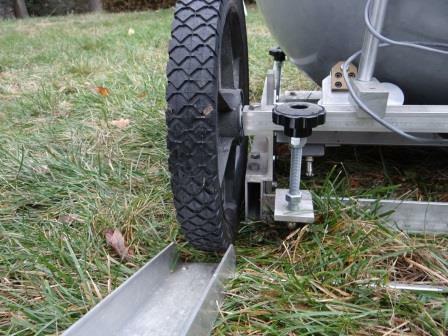 Two 14 inch diameter lawnmower wheels permanently attached to the frame of the drive platform, behind the tracking motors, provide the rolling element to move the telescope around, even on uneven ground. 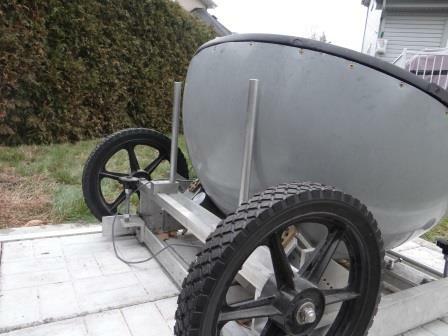 When the carrying handle is lifted up to about waist position, most of the weight of the telescope rests on these wheels, making moving the telescope very easy. 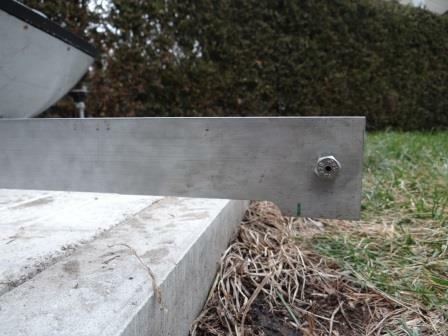 To prevent the tube from rolling off the platform, I also added two long and easily retractable aluminum rods that will catch the rolling hemisphere when it is inclined more than the latitude where the instrument is observing. VERY IMPORTANT TO NOT FORGET TO INSTALL THESE BEFORE TRANSPORTING! 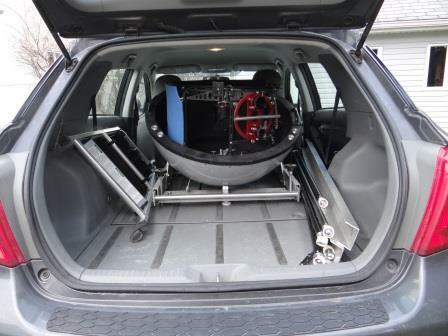 Once taken apart, a roughly three minute operation, the dismantled telescope can be transported in almost any hatchback car, when the back seats are lowered. 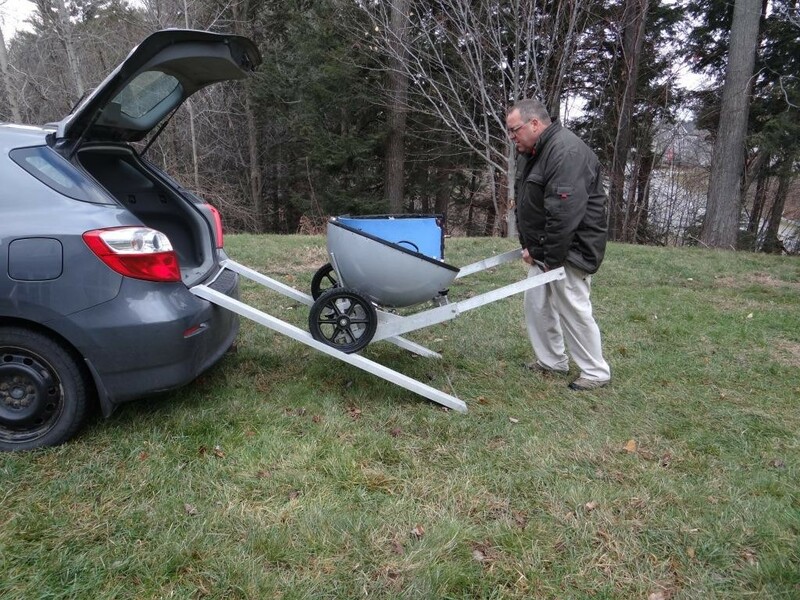 As long as the trunk opening is at least 32 inches wide, 36 inches deep and 30 inches high, it will fit. 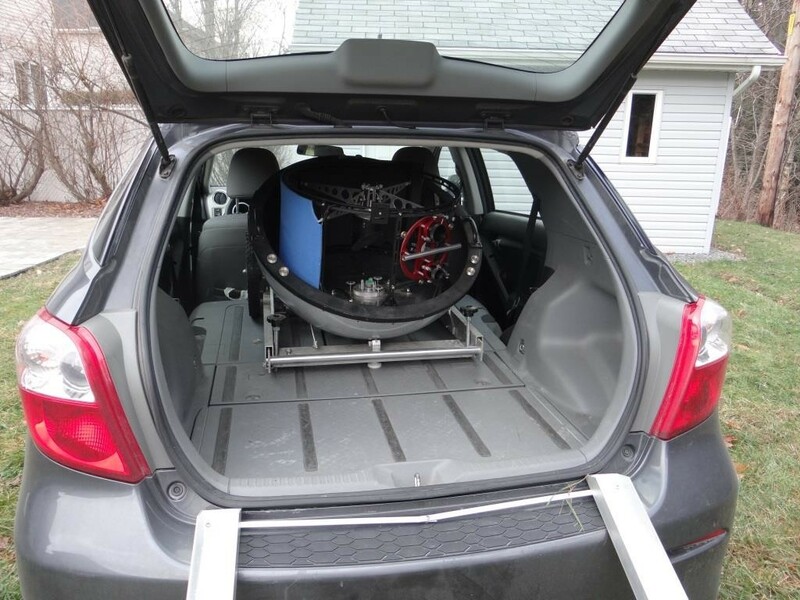 I regularly carry the telescope in my Toyota Matrix with a lot of room to spare. 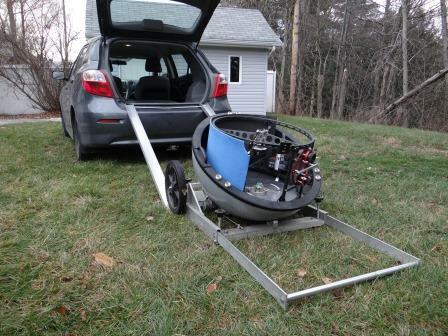 I use two 3 inch wide aluminum channels as ramps to roll the telescope in and out of the car. 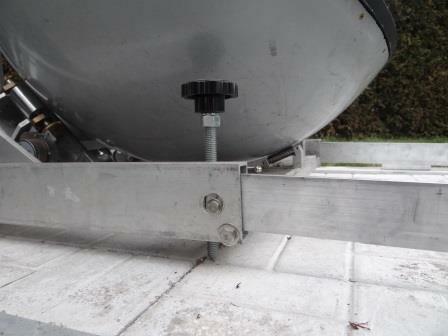 The ramps are attached to each other to ensure proper width, corresponding to the telescope wheel width. It would be better/easier if the ramps were longer but with this length they get out of the way and easily fit in the car. I may someday make a sliding or hinged extension but for now they do the job. Another thing I must improve is to add little hooks that will prevent the ramps (and the telescope) from accidentally falling off the bumper, especially when unloading! If rolling the scope on it’s platform is not possible for some reason (snow, stairs, etc. ), the instrument can be moved in two parts. 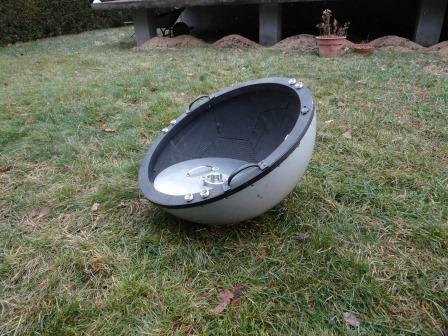 The optical tube bottom (hemisphere, mirror, mirror cover and 12V battery for dew heaters) is equipped with two large handles and, without the UTA nested in it, it weighs about 65 pounds. Certain precautions must be taken when driving with the telescope in the car. Unless the hemisphere is clamped down it will move (rotate) with each turn or slope you take. Also it will move up and slam down on its drive and idle roller supports, eventually damaging the precious hemisphere. So in the car the hemisphere must be tied down to the base with elastic cords.